I stumbled upon this blog while checking out Craftzine today. 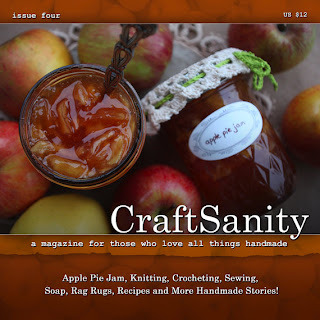 They had a little blurb on Craftsanity's Fall issue of...(I don't know where they came up with this name)...CraftSanity! What drew me to "read more" was the picture of the Apple Pie Jam shown on the cover. We've got a bunch of apples coming our way soon and I hate apple butter, so any new preserve recipes are a treat. I've downloaded and checked out all the projects and I proclaim that it is TOTALLY WORTH IT! The projects are explained in detail, easy enough to do, practical yet pretty and the apple pie jam does look divine. I'm gonna make the jam, the soap, the slippers, the doily blanket, the rug, the... (big plans, we'll see how it goes)! You can see a sneak preview of the great projects here. You can purchase the print or pdf magazine at the Etsy shop or on the blog. That jam looks sooooo good! And the zine looks really neat, I'll check it out.